(below) From ancestry.com re Magna Carta 1215 "Robert FitzWalter 'Marshal of the Army of God and the Holy Church"
Baron FitzWalter is an ancient title in the Peerage of England. It was created in 1295 for Robert FitzWalter. The title was created by writ, which means that it can descend through both male and female lines. His great-grandson, the fourth Baron, was an Admiral of the Fleet. His grandson, the seventh Baron, was succeeded by his daughter and only child, Elizabeth. She was the wife of John Radcliffe. Their son, the ninth Baron, was attainted for treason in 1495 with his title forfeited. However, his son Robert Radcliffe obtained a reversal of the attainder by Act of Parliament in 1509 and later served as Lord Lieutenant of Lancashire. He was created Viscount FitzWalter in 1525 and Earl of Sussex in 1529. His grandson, the third Earl, was summoned to the House of Lords through a writ of acceleration in 1553 in his father's junior title of Baron FitzWalter. Lord Sussex later served as Lord Deputy of Ireland. He was succeeded by his younger brother, the fourth Earl. He had earlier represented Maldon, Hampshire and Portsmouth in the House of Commons and also served as Lord Lieutenant of Hampshire. When he died the titles passed to his only child, the fifth Earl. He was Lord Lieutenant of Essex. On his death in 1629 the barony of FitzWalter separated from the viscountcy and earldom. The latter titles were inherited by the late Earl's cousin and heir male, the sixth Earl, who notably sat as a Member of Parliament for Petersfield, Bedford and Portsmouth. When he died in 1643 the viscountcy and earldom became extinct. The claim to the barony of FitzWalter was passed on to the fifth Earl's heir-general Henry Mildmay, de jure fifteenth Baron. He was the descendant of Lady Frances Mildmay, only daughter of the second Earl of Sussex. He claimed the barony in 1641 and 1645 but was unsuccessful both times and was never summoned to the House of Lords. His grandson Henry Mildmay, de jure sixteenth Baron, unsuccessfully claimed the title in 1660. However, his younger brother Benjamin Mildmay successfully petitioned for the peerage in 1667 and was summoned to the House of Lords as the seventeenth Baron FitzWalter. In 1730 his younger son, the nineteenth Baron, was created Viscount Harwich, in the County of Essex, and Earl FitzWalter, in the Peerage of Great Britain. Lord FitzWalter later served as President of the Board of Trade and was also Lord Lieutenant of Essex. However, on his death in 1756 the viscountcy and earldom became extinct while the barony of FitzWalter fell into abeyance between the daughters of Mary, only sister of the sixteenth and seventeenth Barons. The peerage remained in abeyance for 148 years, until it was called out of abeyance in 1924 (after a petition to the House of Lords) in favour of Henry Fitzwalter Plumptre, who became the twentieth Baron FitzWalter. He was the son of John Bridges Plumptre and grandson of Eleanor, wife of Reverend Henry Western Plumptre and daughter of Sir Brook William Bridges, 4th Baronet, of Goodneston, a descendant of the aforementioned Mary, sister of the sixteenth and seventeenth Barons. Sir Brook William Bridge's eldest son Sir Brook William Bridges, 5th Baronet, of Goodneston, had unsuccessfully claimed the barony in 1842, but was instead created Baron FitzWalter, of Woodham Walter in the County of Essex, in 1868 (for more information on this creation, which became extinct in 1875, see Bridges Baronets of Goodneston). The twentieth Baron died childless in 1932 when the peerage once again fell into abeyance. The abeyance was terminated in 1953 in favour of Fitzwalter Brook Plumptre, the twenty-first Baron. He was the son of George Beresford Plumptre, younger brother of the twentieth Baron. As of 2007 the title is held by his son, the twenty-second Baron, who succeeded in 2004. The family seat is Goodnestone Park. The house was built in 1704 by Sir Brook Bridges, 1st Baronet, of Goodneston. The house came into the Plumptre family through the marriage of the aforesaid Eleanor Bridges, daughter of Sir Brook William Bridges, 4th Baronet, of Goodneston, to Reverend Henry Western Plumptre, whose son John Bridges Plumptre inherited it upon the death of the last Bridges Baronet of Goodneston in 1899. The Fitzwalters were of same line as the de Clare. Presuming they were from an unbroken male line, the seventh Lord FitWalter was the last magnate of the House of Dukes of Normandy. The subject of this study is Walter, fifth Lord Fitzwalter. The family were descended from Robert fitzRichard, a younger son of Richard fitzGilbert de Clare. 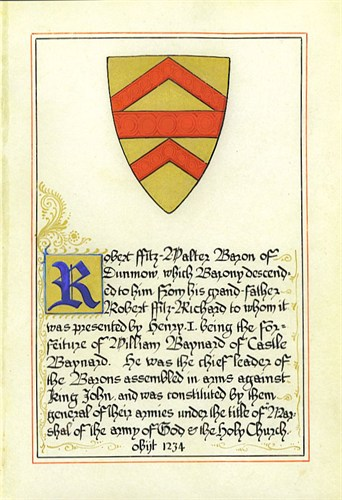 Robert rose in royal service and was rewarded with the honour of Little Dunmow, which had been forfeited by William Baynard, the descendant of the Domesday holder. The barony answered for sixty knights’ fees, concentrated in East Anglia and above all in Essex. In the fourteenth century, the Fitzwalters held thirteen manors in Essex (Ashdon, Burnham-on-Crouch, Cages, Creeksea, Little Dunmow, Henham, Lexden, Maldon, Sheering, Great Tey, Ulting, Wimbish and Woodham Walter). Although the main family estates were in Essex, the Fitzwalters also held Diss, Fincham and Hempnall in Norfolk and Shimpling and Thurstanton in Suffolk, and the family later acquired lands in Lincolnshire and Cumberland. The most famous member of the family is certainly Robert fitzWalter (d.1235), grandson of Robert and great-great-great-grandfather of our subject but the Fitzwalters had a long tradition of military service and this was maintained by Walter. Walter Fitzwalter was born on 31 May 1345. Although he had been granted some of his father and grandmother’s lands (those held in socage rather than by knight tenure) as early as February 1365, it was only in October 1366 that he officially came of age and received the bulk of his inheritance. However, England and France had been at truce since 1360 and this frustrated any hopes that Fitzwalter may have harboured to prove himself in battle. Instead, in March 1368 he received licence to cross overseas with a small retinue, silver plate and a bill of exchange for 600m. It is unlikely that Fitzwalter was planning an elaborate picnic. The most likely explanation is that he was off to pass the season fighting on the Baltic frontier (perhaps the medieval knight’s equivalent of a package holiday). However, we only know about Fitzwalter’s crusading activity from a story recounted by Jean Froissart. In 1380, Fitzwalter (as marshal of the host) was leading the English army through the forest of Marchenoir and past the castle of Vievy-le-Rayé (cant. Ouzouer-le-Marché, dep. Loir-et-Cher), whose lord had assembled a large force of knights and esquires. On seeing this, Fitzwalter departed from the route ‘but not to assault [the castle], but to speak with the knight manning the barrier, whom he knew well, having been with him in Prussia’. The most likely occasion for Fitzwalter to have been in the Baltic is in 1368 (although he also had a similar permission to leave the country in January 1379). Alternatively, it is possible that Fitzwalter was part of the entourage of Lionel of Antwerp, Edward III’s second surviving son, who was travelling to Italy to marry Violante Visconti. The prospects for a military career brightened considerably in 1369 with the resumption of hostilities between England and France and Fitzwalter’s first definite military service (and certainly his first for the English crown) came in this year. John of Gaunt, duke of Lancaster, had already crossed over to France with an advance force and in the summer and autumn of 1369 Edward III raised an army to reinforce Lancaster. The original plan was for Edward to lead the second army to France himself and then to assume overall charge of the combined English forces. The untimely death of Queen Philippa disrupted these plans and in his grief, Edward decided not to travel to France himself. In spite of the king’s absence, the second army was sent to join Lancaster. Fitzwalter served in this second army with a retinue of twenty men-at-arms (himself included) and thirty archers. Unfortunately, the particulars of each retinue do not survive, and so we cannot recover the names of the men who served under Fitzwalter. The second army arrived in France in September but, with the exception of a failed attack on Harfleur, Lancaster showed little inclination to force an engagement and returned to Calais in November. Perhaps disappointed with the lack of action the previous year, Fitzwalter took part in the ill-fated campaign of 1370, contributing a retinue of forty men-at-arms and forty archers in an army of around 3,000 soldiers. The army set out from Calais in July 1370 and proceeded to advance west towards Brittany, marching across northern France and pillaging the countryside as they went. Despite this provocation, the French refused battle, denying the English the chance of a decisive victory. The English force was led by Sir Robert Knolles, an experienced soldier and freebooter but only of modest birth. Knolles’ elevation, in spite of the fact that several barons of greater social standing were included in the party, was controversial. Furthermore, the expedition of 1370 was a financial experiment; the king promised to pay wages for only the first thirteen weeks of the campaign, and the participants were thereafter to fund themselves from the profits of war, like routiers. This seems to have undermined the discipline of the army and may have prompted the Gloucestershire knight Sir John de Minsterworth to complain of the indignity of serving under Knolles, whom he dismissed as an ‘elde theef’. As a result of this dissension and to soothe the wounded egos of the lords, it seems as though the army was re-organised into smaller divisions, one of which was captained by Fitzwalter. This proved a disastrous error and part of the divided army was picked off by the French at Pontvallain (chief-lieu du canton, dep. Sarthe). Fitzwalter himself was captured and sent to Paris with several other noble prisoners. This was a major setback for the family. Fitzwalter had left for France hoping to return a richer man but instead he found himself all but bankrupted. There seem to have been considerable difficulties in agreeing and raising a ransom and Fitzwalter was still being held abroad in November 1373. The close rolls contain a series of agreements drawn up with John de Kingsford, Fitzwalter’s attorney in England, to whom Fitzwalter seems to have owed at least £800. Probably in order to clear this debt, Fitzwalter granted his Moulton interests in Cumberland, including the castle of Egremont, to two men who ultimately represented the king’s mistress Alice de Perrers. Fitzwalter was to recover his lands by repaying £1,000 in 1385. After Perrers’ disgrace, her lands, including Egremont, were seized by the king and Fitzwalter may only have recovered Egremont in August 1386. Another leading courtier William Lord Latimer acquired an interest in some of the Fitzwalter’s other lands in Lincolnshire and London. Fitzwalter also sold or leased his manor of Moulton (Lincs.) to Sir Matthew Redman, with whom he had served in 1370, for 200m. The belief that members of the court had profited from his misfortune may have inspired Fitzwalter’s apparent support for the work of the Good Parliament in 1376-7. Fitzwalter’s capture and subsequent detention in France interrupted his career and he does not appear again until the political upheavals of 1376-7. Fitzwalter’s involvement in these events poses numerous questions about his political connections and motivations. There is no record of his involvement in the Good Parliament of 1376, although he was probably present as a peer and he was definitely appointed to the inter-communing committee between the Lords and Commons in January 1377. However, the initial opposition did include Henry Percy, earl of Northumberland and Fitzwalter’s uncle, and Guy Lord Brian. In 1377 Lancaster, now supported by Percy, launched a royalist counter-attack. In response, Fitzwalter and Brian intervened in a meeting of the council of London to rouse the citizens against Lancaster and Percy. A mob rushed the Marshalsea and Lancaster and Percy were perhaps fortunate to escape the city with their lives. This episode is very difficult to explain, especially given the generally close relationship between Brian/Fitzwalter and Lancaster/Percy. However, there is a hitherto unnoticed document that may shed some light on this confused situation. In July 1376 Fitzwalter and Brian, with three leading Londoners, acted as pledges for a group of Italian merchants whose assets had been seized. This certainly indicates that Fitzwalter and Brian enjoyed particularly close connections with the city at the height of the political crisis and we may tentatively advance the hypothesis that they were acting as liaisons between the Londoners and the noble opposition to the court in 1376. Seen from this perspective, Fitzwalter’s speech to the Londoners takes on a more calculated air. Fitzwalter also had personal grievances against leading courtiers, as we have seen. Furthermore, Percy had been one of the leaders of the opposition to the court in 1376 and Fitzwalter may have felt personally betrayed by his defection. Whatever the true interpretation of Fitzwalter’s role in the crisis of 1376-7, he was soon reconciled with Lancaster and Percy. In April 1377 he was summoned to a great council at Windsor by Edward III, along with Lancaster, Buckingham, Percy, Latimer and other great magnates. This may have been the occasion for Fitzwalter to have rebuilt some bridges with these men. It would also not be the first time that a young lord who had proved his ability in opposition to the king was subsequently taken into royal service. Afterwards Fitzwalter moved firmly into the orbit of Thomas of Woodstock, earl of Buckingham. In 1377 and 1378 he served under Buckingham in the fleets that patrolled the English coasts. In the latter year, although he clearly played an important role within the English army (the St. Albans chronicler names him fourth after Buckingham, the duke of Brittany and Lord Latimer), Fitzwalter served within Buckingham’s retinue and did not led his own contingent. Rather, he appears as part of Buckingham’s retinue on the muster-roll, described as a banneret and listed second after Buckingham himself. There is therefore no separate muster or account for Fitzwalter and his followers and so the names of those who served under him are not known, although we can perhaps identify some Fitzwalter followers within the larger Buckingham retinue. He was put in charge of one of the naval squadrons and, despite a near-mutiny among the sailors of his squadron, was still involved in Buckingham’s victory over a Castilian fleet that resulted in the capture of eight ships. In the context of Fitzwalter’s relationship with Buckingham and his local connections in Essex, it is notable that his attorneys were Sir Robert de Tey and John de Gildesbrough, both Essex landowners with close ties to Buckingham. Fitzwalter was abroad again in 1379, but, for once, not on campaign. On 17 January he was granted licence to travel abroad with six men and horses and to take a bill of exchange for 100m. It is possible that this was the occasion when he went to Prussia, as per Froissart’s anecdote, but, given his recent and future activity in English armies and his financial woes, it is perhaps more likely that he was setting out on a pilgrimage or resolving unfinished business from his capture in 1370. Again, it is interesting that one of his attorneys was his uncle Sir Thomas Percy (brother of Henry), and this suggests that any ill-feeling from the events of 1376-7 had been smoothed over. In a further indication of his close relationship with Buckingham, and also of the high regard in which he was held by the earl, Fitzwalter acted as Buckingham’s deputy (as constable of England) in a Court Martial case in March 1380. From 1378 onwards, Fitzwalter also served with Buckingham as a tryer of parliamentary petitions concerning Gascony and overseas. However, it was not long before Fitzwalter was back on active duty and he served as Marshal of Buckingham’s army in Brittany between July 1380 and April 1381. His duties as Marshal included responsibility for the route of the army, as we have seen, and arranging the numerous tourneys that were held during the campaign. Fitzwalter also played a key role in the one notable military event of the whole campaign, namely the siege of Nantes. He was assigned to guard the gate of Saint-Pierre and this seems to have been a strategically-important position, since it was the target of two strong sorties by the French garrison, both of which were driven back. Eventually, Buckingham admitted failure and broke of the siege. The English army remained in Brittany over the winter and preparations were made to renew the war in the spring. However, the campaign had to be abandoned when the duke of Brittany, on whose behalf the English army was fighting, agreed a peace settlement with the French. A further point about this campaign may require some clarification. Froissart states that Fitzwalter’s son and heir (imaginatively-named Walter) was knighted by Buckingham during the campaign. This may conflict with modern ideas of good parenting (even in the age of ‘bring your child to work’ days), since the younger Walter could only have been eleven or twelve years old at the time. Perhaps he was unusually precocious, although it was not unusual for boys in their early teens to be knighted on campaign. The presence of the younger Walter also seems to receive some support from the records. In particular, a certain ‘Water Fitzwalter’ juniore (the younger) appears in the French roll recording the appointment of attorneys, and it would be tempting to identify this man with the young son of Lord Fitzwalter. However, there is an alternative explanation. Walter Fitzwalter juniore is described as the ‘lord of Wodeham’ and he can actually be identified with our Walter Lord Fitzwalter. This leaves us with the question of why the thirty-five year old Fitzwalter should require the designation ‘junior’. In fact, we can find some contemporaneous documents in which he appears as the lord of Woodham, in order to distinguish him from his uncle, another Walter Fitzwalter, who is described as ‘the elder’. Buckingham and Fitzwalter returned to England in time for the Peasants’ Revolt. Their activites during the initial stages of the crisis are unclear but both were to play an important role in suppressing the peasant’s revolt in Essex. Fitzwalter was named third, after the earls of Buckingham and Oxford, in the powerful commission appointed to restore order to the county. Although Buckingham was nominally in charge of the suppression of the remaining rebels in the county, it was a force led by Fitzwalter and Sir John de Harleston (another Buckingham retainer) that ambushed and routed a force of rebels at Sudbury. Goodman thought that ‘this rapid success against hardened rebels, taking refuge in difficult country, was no mean achievement’. This praise was directed towards Buckingham, but Fitzwalter was perhaps at least as deserving of such recognition. In the years following 1381 Fitzwalter seems to have played a particularly prominent role in Essex, serving on commissions of the peace and array and receiving orders to seize named rebels. In the years after 1381 Fitzwalter appears more often independently rather than serving with Buckingham or Lancaster. This does not mean that he had severed his ties with these two, but rather that he had become one of their most valued allies and they had sufficient confidence to trust him with a more autonomous role. In October 1382 Fitzwalter was appointed admiral north of the Thames and while he may have served until December 1383, when the next admiral was appointed, although there are no orders to Fitzwalter as admiral after March 1383. This is not as surprising as it may sound to modern ears, since at this time there was no permanent navy and the specialist role of admiral had yet evolved. Rather, naval battles were decided by a series of melee combats between men-at-arms fighting from ship to ship, supported by fire from the archers. Moreover, as we have seen, Fitzwalter had some naval experience from 1378. This was also a position of some financial responsibility, since Fitzwalter was responsible for collecting the export custom from the ports along the east coast of England between London and Berwick. By December 1383, Fitzwalter was serving as one of three wardens of the West March of Scotland. This also requires explanation. Although Fitzwalter was not the most obvious choice for this role, since the bulk of the family lands lay in East Anglia, he did enjoy sufficient landed and family connections in the north to justify his appointment. He had inherited Egremont (Cumbs.) from his grandmother Joan de Moulton, although it had been mortgaged back in 1375, and was related by marriage to the Percy and Clifford families. It is also an interesting appointment because Lancaster and Buckingham led an expedition into southeast Scotland in spring 1384 and, rather than include Fitzwalter in their force, they preferred to entrust him with an independent position of some responsibility. In particular, they needed someone able and trustworthy to monitor the situation in the north while they were absent on campaign, especially given the recent distrust between Lancaster and Henry Percy, now earl of Northumberland and the dominant figure in northern England. In 1385 Fitzwalter was again summoned for service against the Scots and, since he does not appear to have led a retinue himself, he may have served in Buckingham’s contingent. Fortunately, the muster roll listing the men who served under Fitzwalter on the west March in 1384 survives. The roll names sixty-four men-at-arms (Fitzwalter himself, with five knights and fifty-eight esquires) and 124 archers. This can be used to identify members of Fitzwalter’s following. Based on a cursory examination, it is possible to identify three of the knights (Walden, Goldingham, Cornard) and ten of the esquires (Tey, Bigod, Wrench, Lynde, Donesby, Blomster, Pentlow, Aldham, Dengaine, and Masham) as being linked either to Essex or to the Fitzwalters. A more detailed examination of the names in this list would undoubtedly reveal more men with Essex connections. Furthermore, this is far from a complete list of Fitzwalter’s military following. He led retinues of twenty men-at-arms and thirty archers in 1369 and forty men-at-arms and forty archers in 1370 and, when he served as part of the retinue of Buckingham or Lancaster in 1380-1, 1385 and 1386, he doubtless contributed his own men to their larger forces. For example, in 1386 Peter de Boxted, son of a former sheriff of Essex, was ‘minded to pass out of the realm in the company of Sir Wauter fitz Walter’. This confirms what we know from other sources, namely that Fitzwalter enjoyed strong ties with local gentry in Essex. Fitzwalter’s next and, as it turned out, last action was to serve in Lancaster’s Spanish campaign of 1386. Again, two Walter Fitzwalters served under Gaunt and both appointed the same attorneys. One is described as a banneret (Walter VII) and the other as a knight. Again, this could refer to Walter son of Robert Fitzwalter (‘the elder’) or to Fitzwalter’s son and heir, Walter, now aged eighteen. 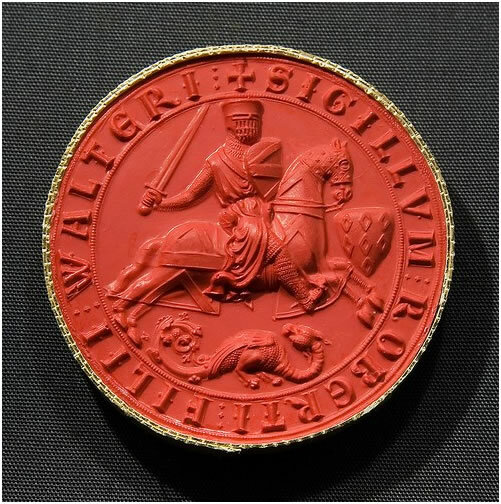 At this point in time, however, Walter son of Robert must have been into his sixties and, since we know that he was dead by January 1387 at the very latest, it is perhaps more likely that it was the future Walter VIII who set out with his father. En route to Galicia, Lancaster’s fleet stopped in Brittany to relieve the English-held port of Brest, which had been besieged by the duke of Brittany, who had been an English ally in 1380, and Fitzwalter was singled out for praise for his role in the storming of the Breton forts. 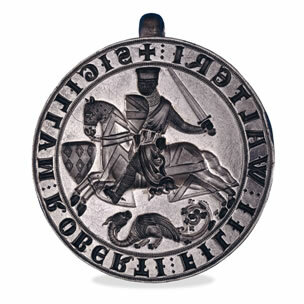 This proved a fitting final appearance for Fitzwalter as he died late in September 1386. This was doubly-unfortunate: first he was then aged forty-one and in the prime of his military and political life, and second he died not in battle but of disease. From above book – ‘such attacks clearly gave the landowning class a fright, but their buildings and occupants were rarely at risk. The destruction that did occur was principally the consequences of targeting specific owners and the settlement of personal vendettas. According to the well-informed Anonimalle Chronicle, the rebels in East Anglia and in Kent ‘threw the buildings to the ground and set those ablaze who would not rise with them (Anonimalle Chronicle 1333 – 1381 ed. V.H. Galbraith (1927), 134, 151). The Anonimalle Chronicle was taken from an MS written at St Mary’s Abbey York. For two weeks during June 1381 East Anglia plunged into a state of near anarchy initiated by popular disturbances near Brentford (?) in Essex. The eye of the revolt centred on the storming of London by the men of Kent and Essex ending with the assassination of their leader Wat Tyler on the 15th June. No attempt has been made to evaluate the extent of such damage but presumably these were modest dwellings and tenements. The few magnate houses that were plundered, such as that of Lord Fitzwalter (died 1386) of Henham, Essex, and the many gentry houses, such as those of the Escheator and the Sheriff of Essex at Coggeshall, Hugh Falstolf at Yarmouth, and Michael de la Pole at Wingfield, were ransacked for the manorial court rolls and other legal documents they held. They were the record and statement of villain status, servile dues, and labour obligations that the insurgents sought to eradicate. Walter Fitzwalter was born on 31 May 1345. Although he had been granted some of his father and grandmother's lands (those held in socage rather than by knight tenure) as early as February 1365, it was only in October 1366 that he officially came of age and received the bulk of his inheritance. However, England and France had been at truce since 1360 and this frustrated any hopes that Fitzwalter may have harboured to prove himself in battle. Instead, in March 1368 he received licence to cross overseas with a small retinue, silver plate and a bill of exchange for 600m. It is unlikely that Fitzwalter was planning an elaborate picnic. The most likely explanation is that he was off to pass the season fighting on the Baltic frontier (perhaps the medieval knight's equivalent of a package holiday). However, we only know about Fitzwalter's crusading activity from a story recounted by Jean Froissart. In 1380 Fitzwalter (as marshal of the host) was leading the English army through the forest of Marchenoir and past the castle of Vievy-le-Rayé (cant. Ouzouer-le-Marché, dep. Loir-et-Cher) whose lord had assembled a large force of knights and esquires. On seeing this Fitzwalter departed from the route 'but not to assault [the castle] but to speak with the knight manning the barrier whom he knew well, having been with him in Prussia'. The most likely occasion for Fitzwalter to have been in the Baltic is in 1368 (although he also had a similar permission to leave the country in January 1379). Alternatively it is possible that Fitzwalter was part of the entourage of Lionel of Antwerp, Edward III's second surviving son, who was travelling to Italy to marry Violante Visconti. The prospects for a military career brightened considerably in 1369 with the resumption of hostilities between England and France and Fitzwalter's first definite military service (and certainly his first for the English crown) came in this year. John of Gaunt, Duke of Lancaster, had already crossed over to France with an advance force and in the summer and autumn of 1369 Edward III raised an army to reinforce Lancaster. The original plan was for Edward to lead the second army to France himself and then to assume overall charge of the combined English forces. The untimely death of Queen Philippa disrupted these plans and in his grief, Edward decided not to travel to France himself. In spite of the king's absence, the second army was sent to join Lancaster. Fitzwalter served in this second army with a retinue of twenty men-at-arms (himself included) and thirty archers. Unfortunately the particulars of each retinue do not survive and so we cannot recover the names of the men who served under Fitzwalter. The second army arrived in France in September but, with the exception of a failed attack on Harfleur, Lancaster showed little inclination to force an engagement and returned to Calais in November. Perhaps disappointed with the lack of action the previous year Fitzwalter took part in the ill-fated campaign of 1370 contributing a retinue of forty men-at-arms and forty archers in an army of around 3,000 soldiers. The army set out from Calais in July 1370 and proceeded to advance west towards Brittany, marching across northern France and pillaging the countryside as they went. Despite this provocation the French refused battle, denying the English the chance of a decisive victory. The English force was led by Sir Robert Knolles, an experienced soldier and freebooter, of modest birth. Knolles' elevation, in spite of the fact that several barons of greater social standing were included in the party, was controversial. Furthermore the expedition of 1370 was a financial experiment; the king promised to pay wages for only the first thirteen weeks of the campaign and the participants were thereafter to fund themselves from the profits of war like routiers. This seems to have undermined the discipline of the army and may have prompted the Gloucestershire knight Sir John de Minsterworth to complain of the indignity of serving under Knolles, whom he dismissed as an 'elde theef'. As a result of this dissension and to soothe the wounded egos of the lords, it seems as though the army was re-organised into smaller divisions, one of which was captained by Fitzwalter. This proved a disastrous error and part of the divided army was picked off by the French at Pontvallain (chief-lieu du canton, dep. Sarthe). Fitzwalter himself was captured and sent to Paris with several other noble prisoners. This was a major setback for the family. Fitzwalter had left for France hoping to return a richer man but instead he found himself all but bankrupted. There seem to have been considerable difficulties in agreeing and raising a ransom and Fitzwalter was still being held abroad in November 1373. The close rolls contain a series of agreements drawn up with John de Kingsford, Fitzwalter's attorney in England, to whom Fitzwalter seems to have owed at least £800. Probably in order to clear this debt, Fitzwalter granted his Moulton interests in Cumberland, including the castle of Egremont, to two men who ultimately represented the king's mistress Alice de Perrers. Fitzwalter was to recover his lands by repaying £1,000 in 1385. After Perrers' disgrace, her lands, including Egremont, were seized by the king and Fitzwalter may only have recovered Egremont in August 1386. Another leading courtier William Lord Latimer acquired an interest in some of the Fitzwalter's other lands in Lincolnshire and London. Fitzwalter also sold or leased his manor of Moulton (Lincs.) to Sir Matthew Redman, with whom he had served in 1370, for 200m. The belief that members of the court had profited from his misfortune may have inspired Fitzwalter's apparent support for the work of the Good Parliament in 1376-7. Fitzwalter's capture and subsequent detention in France interrupted his career and he does not appear again until the political upheavals of 1376-7. Fitzwalter's involvement in these events poses numerous questions about his political connections and motivations. There is no record of his involvement in the Good Parliament of 1376, although he was probably present as a peer and he was definitely appointed to the inter-communing committee between the Lords and Commons in January 1377. However, the initial opposition did include Henry Percy, Earl of Northumberland and Fitzwalter's uncle and Guy Lord Brian. In 1377 Lancaster, now supported by Percy, launched a royalist counter-attack. In response Fitzwalter and Brian intervened in a meeting of the council of London to rouse the citizens against Lancaster and Percy. A mob rushed the Marshalsea and Lancaster and Percy were perhaps fortunate to escape the city with their lives. This episode is very difficult to explain, especially given the generally close relationship between Brian/Fitzwalter and Lancaster/Percy. However, there is a hitherto unnoticed document that may shed some light on this confused situation. In July 1376 Fitzwalter and Brian, with three leading Londoners, acted as pledges for a group of Italian merchants whose assets had been seized. This certainly indicates that Fitzwalter and Brian enjoyed particularly close connections with the city at the height of the political crisis and we may tentatively advance the hypothesis that they were acting as liaisons between the Londoners and the noble opposition to the court in 1376. Seen from this perspective, Fitzwalter's speech to the Londoners takes on a more calculated air. Fitzwalter also had personal grievances against leading courtiers, as we have seen. Furthermore, Percy had been one of the leaders of the opposition to the court in 1376 and Fitzwalter may have felt personally betrayed by his defection. Whatever the true interpretation of Fitzwalter's role in the crisis of 1376-7, he was soon reconciled with Lancaster and Percy. In April 1377 he was summoned to a great council at Windsor by Edward III, along with Lancaster, Buckingham, Percy, Latimer and other great magnates. This may have been the occasion for Fitzwalter to have rebuilt some bridges with these men. It would also not be the first time that a young lord who had proved his ability in opposition to the king was subsequently taken into royal service. Afterwards Fitzwalter moved firmly into the orbit of Thomas of Woodstock, Earl of Buckingham. In 1377 and 1378 he served under Buckingham in the fleets that patrolled the English coasts. In the latter year, although he clearly played an important role within the English army (the St. Albans chronicler names him fourth after Buckingham, the Duke of Brittany and Lord Latimer) Fitzwalter served within Buckingham's retinue and did not led his own contingent. Rather, he appears as part of Buckingham's retinue on the muster-roll, described as a banneret and listed second after Buckingham himself. There is therefore no separate muster or account for Fitzwalter and his followers and so the names of those who served under him are not known although we can perhaps identify some Fitzwalter followers within the larger Buckingham retinue. He was put in charge of one of the naval squadrons and, despite a near-mutiny among the sailors of his squadron, was still involved in Buckingham's victory over a Castilian fleet that resulted in the capture of eight ships. In the context of Fitzwalter's relationship with Buckingham and his local connections in Essex, it is notable that his attorneys were Sir Robert de Tey and John de Gildesbrough, both Essex landowners with close ties to Buckingham. Fitzwalter was abroad again in 1379, but, for once, not on campaign. On 17 January he was granted licence to travel abroad with six men and horses and to take a bill of exchange for 100m. It is possible that this was the occasion when he went to Prussia, as per Froissart's anecdote, but, given his recent and future activity in English armies and his financial woes, it is perhaps more likely that he was setting out on a pilgrimage or resolving unfinished business from his capture in 1370. Again, it is interesting that one of his attorneys was his uncle Sir Thomas Percy (brother of Henry) and this suggests that any ill-feeling from the events of 1376-7 had been smoothed over. In a further indication of his close relationship with Buckingham, and also of the high regard in which he was held by the Earl, Fitzwalter acted as Buckingham's deputy (as constable of England) in a Court Martial case in March 1380. From 1378 onwards Fitzwalter also served with Buckingham as a tryer of parliamentary petitions concerning Gascony and overseas. However, it was not long before Fitzwalter was back on active duty and he served as Marshal of Buckingham's army in Brittany between July 1380 and April 1381. His duties as Marshal included responsibility for the route of the army, as we have seen, and arranging the numerous tourneys that were held during the campaign. Fitzwalter also played a key role in the one notable military event of the whole campaign, namely the siege of Nantes. He was assigned to guard the gate of Saint-Pierre and this seems to have been a strategically-important position since it was the target of two strong sorties by the French garrison, both of which were driven back. Eventually, Buckingham admitted failure and broke off the siege. The English army remained in Brittany over the winter and preparations were made to renew the war in the spring. However, the campaign had to be abandoned when the Duke of Brittany, on whose behalf the English army was fighting, agreed a peace settlement with the French. A further point about this campaign may require some clarification. Froissart states that Fitzwalter's son and heir (imaginatively-named Walter) was knighted by Buckingham during the campaign. This may conflict with modern ideas of good parenting (even in the age of 'bring your child to work' days), since the younger Walter could only have been eleven or twelve years old at the time. Perhaps he was unusually precocious, although it was not unusual for boys in their early teens to be knighted on campaign. The presence of the younger Walter also seems to receive some support from the records. In particular, a certain 'Water Fitzwalter' juniore (the younger) appears in the French roll recording the appointment of attorneys and it would be tempting to identify this man with the young son of Lord Fitzwalter. However, there is an alternative explanation. Walter Fitzwalter juniore is described as the 'lord of Wodeham' and he can actually be identified with our Walter Lord Fitzwalter. This leaves us with the question of why the thirty-five year old Fitzwalter should require the designation 'junior'. In fact, we can find some contemporaneous documents in which he appears as the lord of Woodham, in order to distinguish him from his uncle, another Walter Fitzwalter, who is described as 'the elder'. Buckingham and Fitzwalter returned to England in time for the Peasants' Revolt. Their activities during the initial stages of the crisis are unclear but both were to play an important role in suppressing the peasant's revolt in Essex. Fitzwalter was named third, after the Earls of Buckingham and Oxford, in the powerful commission appointed to restore order to the county. Although Buckingham was nominally in charge of the suppression of the remaining rebels in the county, it was a force led by Fitzwalter and Sir John de Harleston (another Buckingham retainer) that ambushed and routed a force of rebels at Sudbury. Goodman thought that 'this rapid success against hardened rebels, taking refuge in difficult country, was no mean achievement'. This praise was directed towards Buckingham, but Fitzwalter was perhaps at least as deserving of such recognition. In the years following 1381 Fitzwalter seems to have played a particularly prominent role in Essex, serving on commissions of the peace and array and receiving orders to seize named rebels. In the years after 1381 Fitzwalter appears more often independently rather than serving with Buckingham or Lancaster. This does not mean that he had severed his ties with these two but rather that he had become one of their most valued allies and they had sufficient confidence to trust him with a more autonomous role. In October 1382 Fitzwalter was appointed admiral north of the Thames and while he may have served until December 1383, when the next admiral was appointed, although there are no orders to Fitzwalter as admiral after March 1383. This is not as surprising as it may sound to modern ears, since at this time there was no permanent navy and the specialist role of admiral had yet evolved. Rather, naval battles were decided by a series of melee combats between men-at-arms fighting from ship to ship, supported by fire from the archers. Moreover, as we have seen, Fitzwalter had some naval experience from 1378. This was also a position of some financial responsibility since Fitzwalter was responsible for collecting the export custom from the ports along the east coast of England between London and Berwick. By December 1383, Fitzwalter was serving as one of three wardens of the West March of Scotland. This also requires explanation. Although Fitzwalter was not the most obvious choice for this role since the bulk of the family lands lay in East Anglia, he did enjoy sufficient landed and family connections in the north to justify his appointment. He had inherited Egremont (Cumbs.) from his grandmother Joan de Moulton, although it had been mortgaged back in 1375, and was related by marriage to the Percy and Clifford families. It is also an interesting appointment because Lancaster and Buckingham led an expedition into southeast Scotland in spring 1384 and, rather than include Fitzwalter in their force, they preferred to entrust him with an independent position of some responsibility. In particular, they needed someone able and trustworthy to monitor the situation in the north while they were absent on campaign, especially given the recent distrust between Lancaster and Henry Percy, now Earl of Northumberland and the dominant figure in northern England. In 1385 Fitzwalter was again summoned for service against the Scots and, since he does not appear to have led a retinue himself, he may have served in Buckingham's contingent. Fortunately the muster roll listing the men who served under Fitzwalter on the west March in 1384 survives. The roll names sixty-four men-at-arms (Fitzwalter himself, with five knights and fifty-eight esquires) and 124 archers. This can be used to identify members of Fitzwalter's following. Based on a cursory examination, it is possible to identify three of the knights (Walden, Goldingham, Cornard) and ten of the esquires (Tey, Bigod, Wrench, Lynde, Donesby, Blomster, Pentlow, Aldham, Dengaine and Masham) as being linked either to Essex or to the Fitzwalters. A more detailed examination of the names in this list would undoubtedly reveal more men with Essex connections. Furthermore, this is far from a complete list of Fitzwalter's military following. He led retinues of twenty men-at-arms and thirty archers in 1369 and forty men-at-arms and forty archers in 1370 and, when he served as part of the retinue of Buckingham or Lancaster in 1380-1, 1385 and 1386, he doubtless contributed his own men to their larger forces. For example, in 1386 Peter de Boxted, son of a former sheriff of Essex, was 'minded to pass out of the realm in the company of Sir Wauter fitz Walter'. This confirms what we know from other sources, namely that Fitzwalter enjoyed strong ties with local gentry in Essex. BOOK II. In length it is about three, and in breadth two miles : the village contains some good houses, and a place of worship belonging to the Independents; it is on high ground, pleasant, and healthy; distant from Bishop's Stortford seven, and from London thirty-seven miles. In the reign of Edward the confessor, the lands of Henham belonged to Ailid, to two freemen, and to Ansgar, a sochman: at the time of the survey, they were in the possession of Ralph Baynard, Eudo Dapifer, and Geofrey de Magnaville. There are three manors ; and the rectory is also a manor. Henham Hall is near the church ; and the manor is what belonged to Ralph Bay- nard, from whom it passed to his son Geofrey, and to his grandson William, on whose forfeiture, for desertion of the cause of king Henry the first in his contest with Stephen, this possession was given to Robert, a younger son of Richard Fitzgislebert ; whose son Walter was his successor, followed by Robert, son of Walter, who assumed the surname of Fitzwalter, borne by his noble descendants, barons of the realm, for many generations. Elizabeth, daughter and heiress of Walter, lord Fitz- Walter,* con- veyed this inheritance, by marriage, to sir John Ratcliffe, who died in 1461. Robert, his descendant, created earl of Sussex in 1529, to his second lady had Frances, daugh- ter of Hercules Meutas, of W^est Ham, widow of Francis Shute, esq., and she, at the time of her decease, in 1627, held this manor of Henham, and the rectory, of the king by knight's service. Her daughter and heiress, was Jane, married to sir Alexander Ratcliffe, who had this possession in 1635, which he sold to Lawrence Wright, M.D. of Dagenhams, in Havering : he died in 1657, and, with Mary his wife, was buried in the church of South Weald. Sir Henry Wright, bart. of the same place, was his son and heir : he married Anne, daughter of John, lord Crew, of Stene, by whom he had Henry, who died in 1681, aged nineteen, and Anne. He himself having died before his son, in 1663, aged twenty-seven; they are both buried in the church of South Weald. The widow, lady Anne Wright, enjoyed this estate as part of her jointure, till her decease, in 1708, when it descended to her daughter Anne, a very rich heiress; married, first, to Edmund, son of sir Robert Pye, of Farringdon, in Berkshire; afterwards to William Rider, esq. She sold this estate in 1720, with the concurrence of the heirs-at-law, to sir John Blount, hart., one of the directors of the South Sea Company; on the dissolution of which, it was purchased by Samuel Feake, esq., of Shering, succeeded by his son, Stephen Feake, and by J. S. Feake, esq. Plechedon Hall, vulgarly named Prison Hall, is about a mile south-eastward from the church ; beyond which, in the same direction, is Plechedon Green, and the ham- let, which is two miles in extent. This manor includes what belonged to Eudo Dapifer; next to whom the earliest possessor on record was Gilbert Peche in 1274 and a second Gilbert Peche in 1322, held this manor of Adomar de Valence, earl of Pembroke, by the service of a fourth part of a knight's fee ; as did also Gilbert, his son and heir. In 1360, it had become the property of John Malewayn; soon after which it again went to the Peche family, and was conveyed by Katharine, daughter and heiress of sir Geofrey Peche?, to her husband, Thomas Notbend.f She died in 1405, holding this estate of Ralph Neville, earl of Westmoreland, as of his honour of Clavering. Mirabel, wife of Robert Geddying, and Margaret, wife of John Hinkley, were her daughters and co-heiresses. Afterwards the whole estate became vested in Margaret Hinkley, who died possessed of it in 1442, leaving her daughters, Alice, wife of John Marshall, and Cicely, wife of Henry Caldebeck, her co-heiresses. The last of these became ultimately possessed of this estate, leaving two daughters co- heiresses, Thomasine, married to John Turnor, of Haverhill, ancestor of the Tumors of Hallingbury, and Margaret, married to Geofrey Bloodwell, of Thurlow. Henry Turnor, son of John and Thomasine, married Elizabeth, daughter of Edward Brooksby, by whom he had Henry, who held this estate in 1520 and 1528: in 1613, it was holden by William Watts, esq. of sir Francis Barrington, as of his manor and half hundred of Clavering ; with a portion of the tithes out of Plechedon Hall. Afterwards it passed to the Crewe family, and Nathaniel, lord Crewe, bishop of Durham, on his decease, in 1721, left it to Thomas Cartwright, esq., of Aynho, in Northamptonshire, who had married Armine, one of his brother's daughters : afterwards it belonged to William Cartwright, esq. The mansion belonging to the manor of the Broom, is a mile and a half south-west The from the church. Of the proprietors of this estate there is no account from the first owner, Geofrey de Mandeville, to the reign of king James the first. In 1616, sir John Watts died, holding this possession, whose heir was his son John; and early in the succeeding century it belonged to sir Philip Parker, hart., of Arwerton, who sold it to sir John Blount, of the South- Sea Company, and it was afterwards purchased by Mr. John Fell, wine merchant, from whom it passed to Joseph Fell, esq. of Saifron Walden. Little Henham is a hamlet, consisting of a few houses, about a mile north from Little Henham. The church has north and south aisles, the nave is separated from the chancel by a Church. In Domesday, it is placed under the hundred of Clavering; and is stated to be a hamlet in Henham parish, belonging to the leet of Clavering hundred. Many instances occur in other counties of lands exempt from the jurisdiction under which they are situated, and annexed to distant lordships. Suene having been lord of Clavering, may have had extensive authority here, and the hundred may have had its dependants, as the castle of Stortford had, from hence the country had its protection from inroads, in return for which, some estate had to pay towards their support. Arms of Peche : Argent, a fesse gules, between two chevronels of the second. BOOK II. screen, and the Gothic arches of the aisles supported by massive clustered pillars ; the building is large for a country village. A massive tower at the west end, above which a lofty spire rises, contains a good ring of five bells. Plechedon Robert, son of Richard Fitz-Gislebert, gave two parts of his lordship of Henham to Canons priory and canons of Little Dunmow; and his son Walter gave this church of Henham to the same appropriation: this gift was called a manor, and named Plechedon Canons: afterwards the rectorial, or great tithes, being retained by the priory, a vicarage was instituted and endowed in the reign of king Henry the third, which con- tinued in the patronage of the convent till its dissolution; and in 1536, the rectory and advowson of the vicarage were granted to Robert Ratcliffe, earl of Sussex, from whom they passed to the successive owners of Henham Hall. Anne, daughter of John, lord Crewe, married to sir Henry Wright, hart., gave a farm at Little Henham, of about forty pounds a year, for the augmentation of this vicarage. Obit. A tenement, called Sammons, was given for a yearly obit. * In 1821, this parish, with the hamlet of Plechedon, contained eight hundred and four, and in 1831, eight hundred and sixty-three inhabitants. ELSENHAM. Elsenham This parish is surrounded by Henham, Stansted Montfichet, Ugley, and Broxted. A small stream, that puts a corn-mill in motion, separates it from Stansted Montfichet. It is calculated to be two miles across either way : distant from Saffron Walden eight, and from London forty-six miles. In records the name is written, Alsenham, Elsingham, Elsinham, and Elsynham ; the derivation unknown. In the time of the Confessor, these lands were in the divided possession of Lestan, and of Meruena, a free-woman ; and at the survey belonged to John, nephew or grandson of Waleram, and to Robert Gernon ; the former had no other possessions in Essex, and his part of this was much the largest; what belonged to Robert lying contiguous to his seat of Stansted, had been exchanged for another possession less conveniently situated. * Monumental inscriptions, and recorded interments : Walter, lord Fitzvvalter, who died in 1408, by his will, ordered his body to be buried in this church. A grave- stone in the chancel, inlaid with the effigy of a man in white marble, bears a Latin inscription, which informs us that beneath is interred the body of Thomas Kirbie, gent., who died the 26th of October, 1603, leaving Bridget, Robert, and Sussex, his children ; and Anne his wife, only daughter of William Brewster, late of Castle Hedingham, gent., and Mirabella his wife, daughter of John Foley, of Badley. Charities. Henry .Smyth, alderman of London, erroneously and unjustly called Dog Smith, left a good sum of money to purchase lands for the use of the poor of Henham, and other parishes in Essex. There are some alms-houses near the church, the gift of John Measont, of Debden. HUNDRED OF UTTLESFORD. The ancient habitation of Elsenham Hall is near the church : it was named New Hall, to distinguish it from the more ancient manor-house, the site of which is not known ; the name of Nether Hall was also applied to the old mansion. Soon after the Conquest, a noble family named de Abrinci, barons of Folkstone, in Kent, had this manor, of which they retained possession till the decease of William de Abrinci, in 1230, whose son William died young, and Maud, his only sister, a rich heiress, was married to Hamo de Crevecoeur, who died in 1262, holding this manor of the earl of Hereford : he left four daughters his co-heiresses, of whom Isabel, married to Henry de Gant, had this estate : he died in 1271, and his wife in 1283, leaving no issue. The manor afterwards passed to the families of Rochford, Walden, and Barley. Katharine, the sister and co-heiress of John de Walden (who died in 1419, holding Barley this estate), was married to John Barley, junior, of Barley, in Hertfordshire, from whence their name was derived : they were afterwards seated at Albury, in the same county. In 1445, John Barley dying, left his son Henry, who, in 1467, was sheriff of Essex and Hertfordshire, and died in 1475, in possession of the manor of Wicken, and holding jointly with his wife, relict of sir John Colville, all or part of this manor, of sir John Say; which his son William forfeited with his other extensive possessions, for supporting the party of Perkin Warbeck; but he was pardoned by king Henry the seventh; had his estate restored in 1500, and died in 1520, holding this manor of sir William Say, as of his manor of Saysbury: he was succeeded by his son Henry, who died in 1529: having married Anne, relict of lord Grey, he left by her, William, Antony, and three daughters : William married Joyce, daughter of John Perjent, of Digs well, in Hertfordshire, by whom he had two daughters his co-heiresses; Dorothy, married first to Clopton, of Suffolk, afterwards to Thomas, second son of Ed- ward Leventhorpe, esq., of Shingey Hall, in Sawbridgeworth ; and Anne, married to Richard Barley, son of Francis Barley, esq., of Great Waltham, a distant branch of the same family. The Hertford estate was inherited by Dorothy; and Anne conveyed this to her husband, Avho died here in 1594:* Thomas their son and heir, left an only daughter, married to Pine, esq., whose father was of Lincoln's-inn. This gentleman, in 1607, held the manor of Elsenham, the advowson of Springfield church, and the manor of Bibbesworth, in Hertfordshire; but being lunatic, was put under the guardianship of Henry Wiseman, esq., who had married his sister Mary, and they came and lived here : she died in 1635. Sir Thomas Adams, hart, purchased this estate of the heirs of Barley, and dying in 1668, left his son, sir William Adams, who died in 1688, and whose lady, named Jane, died in 1727, at an advanced age. Sir William was succeeded by his second son, sir Thomas, who, dying in 1690, was followed by sir Charles, the sixth son, on whose decease, in 1726, the title and estate descended to sir Robert, the eighth son; who sold this manor to William Dawkins, esq., and he gave it to Bayley Heath, eldest son of Thomas Heath, esq., of Stansted Montfitchet. A manor, or estate, called Elsenham Cross, with a farm belonging to it, were granted, by king Edward the sixth, to Richard Chamond, and others, in 1553, to hold in socage. The church is a short distance from the village, on an eminence ; an embattled square tower, with a slender spire, contains four bells. The entrance to this ancient edifice is under a semi-circular arch, with plain and reticulated Saxon mouldings, and supported by massive pillars, covered with indented moulding, and having capitals rudely formed and of very antique appearance. The whole, as we may reasonably believe, either Saxon, or very early Norman workmanship. This church in 1070 was given to the abbey of St. Stephen, at Caen, in Normandy, by John, nephew of Waleram; and in the reign of king Richard the first, it was the gift of Beatrix, sister of Geofrey de Mandeville, to the monastery at Walden, founded by that earl, though it is not known whether this possession came to that lady, by exchange or purchase. The abbey ordained a vicarage, and retained possession till its dissolution; Avhen the rectory, which is a manor, was granted by king Henry the eighth to Thomas, lord Audley; who bequeathed it to his lady, afterwards married to sir George Norton; from whose daughter and heiress, Margaret, it passed by marriage to Thomas, duke of Norfolk, and to their son, lord Thomas Howard; Avho sold it to John Weever; about the time of the restoration, it was purchased by William Canning, esq,, whose family retained possession till a late period. *' In 1821, this parish contained four hundred and thirty-four, and in 1831, four hun- dred and eighty-four inhabitants. On a grave stone in the chancel : " Here lieth the body of Thomas, the son of William Adams, esq., grandson to sir Thomas Adams, of Elsenham, bart. He died Jan. 17, 1660." On a brass plate in the chancel : " Here lieth the body of Alice Tuer, who died the wyfe of Doc. Tuer, vicar of this church, with whom she lived twenty-two yeres within two nionets and four days, without any of the least household breaches, either in deede or worde between them, .such was her goodnesse. The widowe (first of Robert Claydon, of Ashdon, in Essex), by whom she had three children, Anne, who died before her mother, leaving behind her a young suckling daughter, called Mary, yet surviving, as also Thomas and John Claydon, who waited bothe at her funerall. Her humble soul God delivered from the downe- pressing birthen of this flesh, Oct. 7, 1619, in the year of her age, as her friends accounted, 72." — A similar inscription records the decease and burial of " Anne, wyfe of Thomas Fielde, only daughter of Alice (at the time of the decease and burial of the said Anne) tlie wife of John Tuer, doctor of lawe, then vicar of Elsnham. By her said sadd mother Alice (the daughter of Maister Richard Fitz-Hugh, of Eaton, in Bedfordshire, esq. ), descended of the ancient and sometimes noble family, whose virtuous soul God took to him.self the 9 of September, 1615, and of her age the 26th, leaving behind her one only image of herself, a young suckling daughter." There are also buried here, sir William Say, with his lady, in 1520. Richard Barley, with his wife, in 1594; and Anne his daughter, and wife of Henry Wiseman, who died in 1635. Charities:— John Wells, fanwright, gave two cottages, of the yearly rent of three pounds ten shillings, to purchase clothing for the poor, at the discretion of the minister and trustees. There is also an endowment to teach two poor children.